General Motors has just announced the initial batch of performance figures for the 2014 Chevrolet Corvette Stingray Coupe and not surprisingly, the C7 has turned out some stunning numbers in pretty much every category – with some supercar-like numbers for 0-60 and the skidpad. There was a point in time where only the world’s most powerful and most expensive supercars could rip from zero to 60 in under 4 seconds, offering cornering grip better than 1g and tickle the 100 foot mark for 60-0 braking times but the 2014 Chevrolet Corvette Coupe does all of that for a price in the mid $50k range. While there are lots and lots of cars in the world that can take a turn at over 1g, hit 60 from a stop in under 4 seconds and get stopped from 60 in around 100 feet – few cars combine all of those attributes into one package and even fewer do it in what is technically a “base model” form. Keep in mind that this isnt the Corvette ZR1 or even the Z06 but instead, a base 2014 Corvette Coupe equipped with the optional Z51 package and Magnetic Ride Control with Performance Traction Management…a car with a price tag right around $56,590. "For the new Stingray, we set out to elevate every aspect of the Corvette's performance," said Tadge Juechter, Corvette chief engineer. 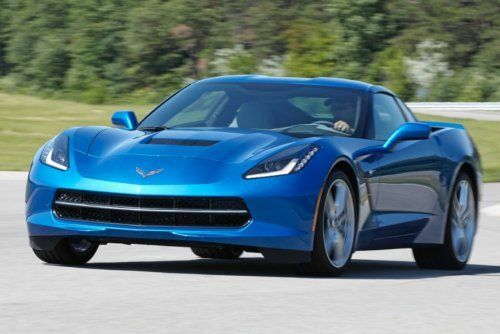 "Considered alone, the acceleration, braking and cornering performance of the Corvette Stingray is truly impressive. More significant is how well they work together, resulting in a lap time at VIR that places the new Stingray in the upper echelon of all sports cars." During internal testing, the 2014 Chevrolet Corvette Coupe with the Z51 handling package and the Magnetic Ride Control system with Performance Traction Management was able to go from a dead stop to 60 miles per hour in just 3.8 seconds. As that acceleration test continued, the test C7 Corvette was able to reach the quarter mile mark in just 12 seconds with a trap speed of 119 miles per hour. GM also found that this nicely equipped C7 Corvette Coupe was able to reach cornering forces of 1.03g on the skidpad – numbers that are comparable to the $375,000 Lexus LFA supercar. "The new Stingray constantly communicates feedback to the driver, which makes you feel incredibly confident behind the wheel," said Jim Mero, Corvette vehicle dynamics engineer. "That confidence encourages you to attack each corner because the Stingray drives so well: the tire grip is incredible; the steering response is some of the best I've ever experienced; the Magnetic Ride dampers allow little body roll through the corner, while still soaking up the rumble strips when you clip the apex," he said. "It's just addictive on the track." After performing the initial testing of the 2014 Chevrolet Corvette Stingray Coupe, the GM crew headed to Virginia International Raceway to put the new C7 to the ultimate test. Virginia International Raceway has been referred to by some as the American Nürburgring and while VIR’ 4.2 mile "Grand Course" is much shorter than “The Ring” – it is one of the best tracks on US soil to test a vehicle’s overall performance capabilities. The 2014 Stingray was able to lap the VIR Grand Course in 2:51.78 and while GM doesn’t offer any basis for comparison, the folks at Car and Driver do. For the past seven years, C&D has tested a long list of performance cars on the VIR Grand Course and among the 136 cars on that list – the 2014 Corvette Stingray ranks 6th overall behind only the Mosler MT900S, the Dodge Viper SRT10 ACR, the Mosler Photon, the Ferrari 458 Italia and the 2012 Corvette ZR1. The base model 2014 Corvette was faster around VIR than every other car tested with a long list of names including Lamborghini, Ferrari, Lexus and many, many others. You can click here to look at the full list of VIR lap times from Car and Driver. These are all stunning numbers and once the 2014 Chevrolet Corvette Stingray Coupe begins reaching owners later this year, we can almost certainly expect to see even better numbers in the hands of private owners with lots of racing experience and seat time in the new Corvette. In the meantime, the preliminary numbers from GM make the 2014 Corvette C7 one of the best performing cars in the world and possibly THE best performance car available today under $60,000.